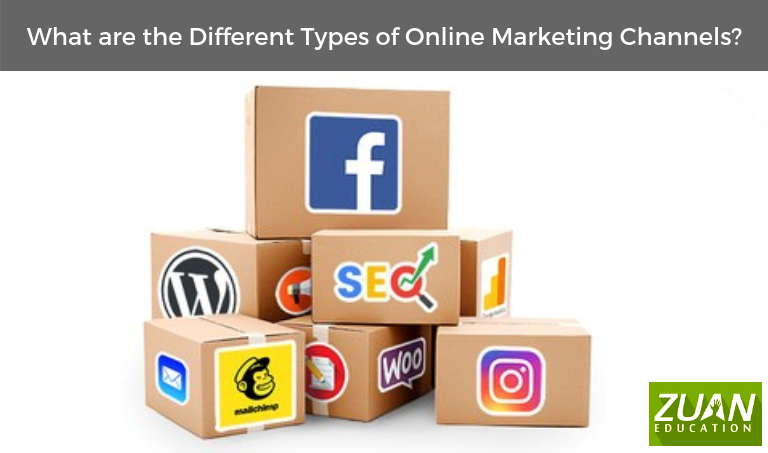 What are the Different Types of Online Marketing Channels? It can be emphatically stated that digital marketing is a powerful way to do business. It can be done through different types of online marketing channels. What are those types of digital marketing channels? That will help you to increase the brand awareness of your product or services. Let’s look into each one by one. Old is Gold. And that is email marketing. You can do this by sending clear and attractive newsletter sign-up form. For your visitors to fill in. Furthermore, you can provide updates, exciting news, reminders, etc. to your customers in a matter of minutes. Equally, you can use these newsletters as printable, direct mail pieces or even flyers. Email marketing is valued among the types of online marketing channels. Therefore, learning email marketing systematically will be of great value. It helps you to make fully targeted messages. Therefore, you can comprehend where your client is in the purchasing cycle. Moreover, you can make email campaigns for each phase of the client life cycle. Eventually, this permits you to develop loyalty and more conversions. In some way or the other, you stick yourself with someone for success of any type. So is affiliate marketing. Having an edge among the types of online marketing channels. Studying affiliate marketing will be of great benefit. Working with your affiliates can help you to expand your reach. Your affiliates will have access to large audiences. So getting on board with one will prove worthy. Moreover, affiliate marketing is popular with bloggers and high-traffic website owners. They make money from selling other people’s products to their audience. This is leading among the types of online marketing channels. Social media is a best tool to advance your brand image. Learning social media marketing will help you reach millennials. Furthermore, through Social Media Marketing (SMM), you can reach out to highly targeted potential customers. Done through direct and person-to-person engagement. However, you should select the most appropriate social network to promote your business to the intended audience. Facebook – This is leading among social media platforms. You can reach out to almost any kind of general consumer. You just need to learn in what groups and pages your targeted customer stay frequently. Twitter – This is useful if you are developing a new business. Moreover, if you want to reach out to early adopters. then Twitter helps to generate fast brand awareness. LinkedIn – You can reach out to professionals, business owners and other Business-to-Business (B2B) leads and targeted customers. Pinterest – This social network is great if you’re focusing on visuals for promoting your brands and products. Majority of users are also women. So if they are your market, then SMM on Pinterest will be good for your business. Content Is The Reason Why Google Search Exists. So important is your content on the web. Moreover also to learn content marketing rigorously. Content can be in written, audio, or visual form. Your content is usually present in blog posts, e-books, posts on social media, PPC, and even the very pages of your website. Moreover, your content should be creative, engaging, goal-oriented, persuasive and targeted. The ultimate goal is to saturate readers, listeners, and viewers with the idea that your company is the one to do business with. The wheel of a chariot and the chariot itself will come down without the axle. Likewise is SEO leading among the types of online marketing channels. Sufficient SEO knowledge is vital to rank in SERPs. You would use search engines to search for any goods or products. Furthermore, going with a company that appears first on the search engine result pages is the custom. Therefore, SEO can get your company closer to that first page by increasing pages rank. Equally, your landing page should be SEO-optimized for effective internet marketing. A point to remember. Search engines decide which websites to show for a search term based on keywords. Therefore, you have to do a lot of work with SEO. Significantly, you have to use the right keywords or key phrases on your website. Video marketing is the ultimate among the different types of online marketing channels. You combine words and imagery into an intuitive package and video catches the eye of online users. Utilising this form of media via video marketing is a powerful digital marketing technique. You can do video marketing by posting video content on your sites and social media accounts. Furthermore, you can advertise on video sharing sites such as YouTube. Videos act as one of the most interactive types of online marketing. PPC is a promotional technique present everywhere. Learning PPC is simple. You can see this as video or a side image appearing within the margins of a webpage. You need to click on these ads. This is PPC advertising. Moreover, the content of the ads has to be engaging. Also designed to get the consumer to click because that clicking sends them to your web page. PPC works by getting its funding from the clicks themselves. Every time an ad is clicked on, you pay the company placing them on the webpage. For sure this is a trick among the types of online marketing channels. You get someone with a following to endorse your brand. This type of marketing is more visible outside. For example, Nike promotes its brand through Tennis stars. Using another person’s influence you create a pathway between their audience and yours. This encourages the audience to investigate your product or service further. Who told you that dogs are the man’s best friend? No, it is your mobile phone. You take it wherever you go. Cannot afford to stay without it even for a minute. You can create mobile-specific marketing campaigns. Furthermore, AdWords allows for mobile-specific marketing campaigns. Moreover, having an intuitive app for your business can also drive extra sales. Significantly, SMS advertising has been around for some time. Bluetooth technology is still on the rise. Therefore marketing and advertising options for mobile especially in local marketing can be thought of. Your consumers will visit blogs, forums, and other websites that are interesting or useful to them. Therefore you can reach them by placing relevant display ads on these third-party sites. Moreover you also have paid advertising. Display advertising includes banners, boxes, interactive ads, video ads, interstitial ads, overlays, and other similar ads. These are usually found in a landing page or website. Apart from the above-mentioned channels, there are also vital marketing tools that help in your online marketing campaign. You can further master digital marketing channels by learning a digital marketing course. Furthermore, you have now known different types of digital marketing tactics that can benefit your business. You have to make smarter decisions about what channels you use. Likewise, you have to be strategic about your digital marketing strategy. In order to maximize your campaign results while optimizing your budget.